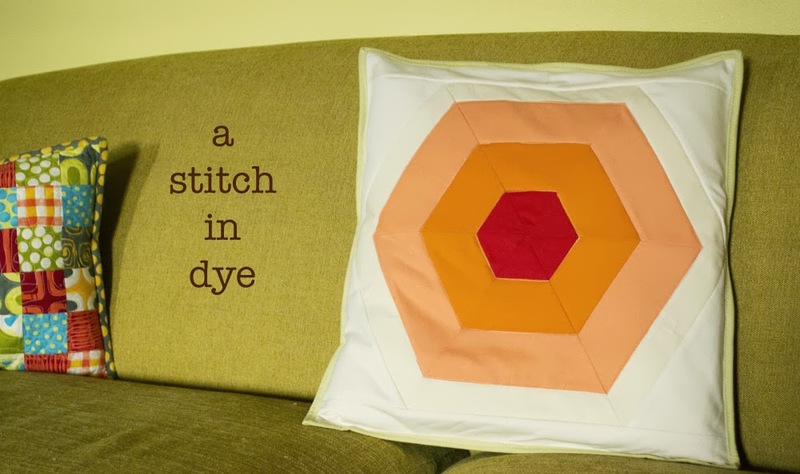 a stitch in dye: Cure For Writer's Block? I had thought I'd post about how I'm determined to add new items to my shop as much as possible this month and to that end I've added this and this as well as created the pillow pictured. 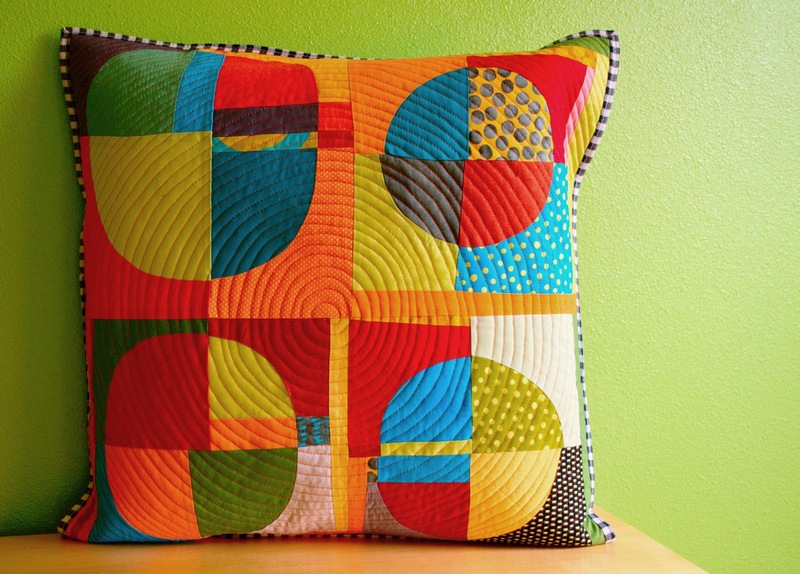 I had thought I'd mention that this pillow was pieced improvisationally and loosely based on the traditional Drunkard's Path block. I was hoping to touch on how much I like the circular quilting, especially for a top that features circles and how fun it is to bind a top that features lots of color with a simple, black and white, graphic print.I was going to say that if you check my store regularly this month, you'll see new items as well as some of the projects from my book and others. Pretty good matching on those seams for improv. I'm impressed! I can hardly believe that you at least didn't plan those circles to match up. Amazing! Love this pillow!! Great improv. This looks so fresh! Can you write a pattern or a simple tute for it.... PLEASE!!! The pillows are so awesome. I love colour. 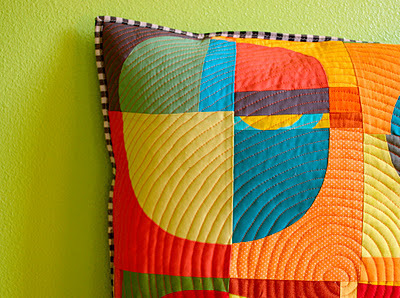 Love those colors and the quilting is amazing. The composition is marvelous darling! 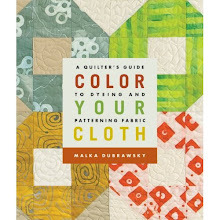 Love the quilting and the colors! Great! 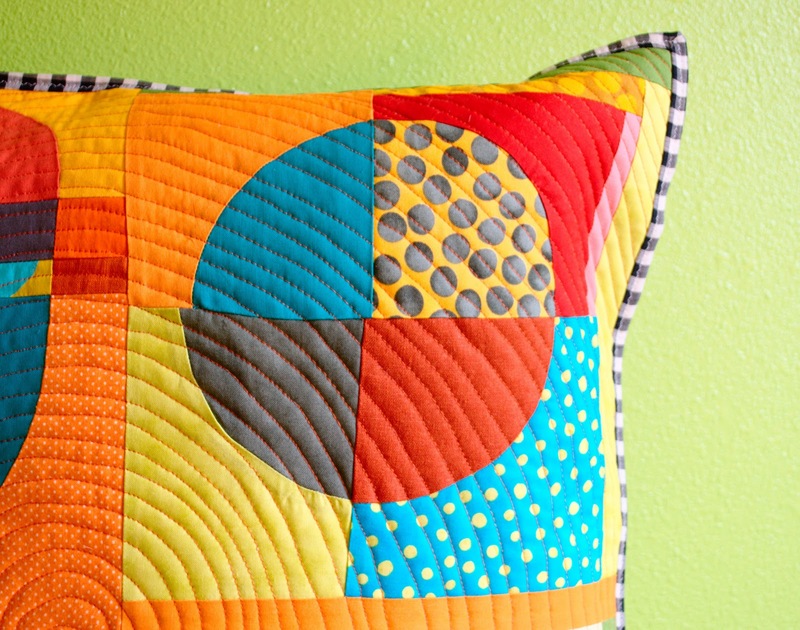 I love the circle quilting! fabulous quilting! Love your blog. Gorgeous! I found your blog via Cheryl's Naptime Quilter. Loving what I'm seeing!